Note: this is a copy of a page from an older version of our website - please enjoy the vintage formatting! 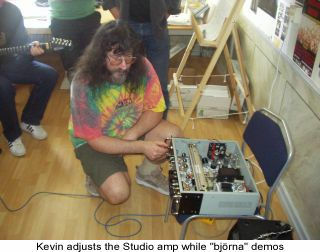 Kevin O'Connor was invited early in 2003 to give a tube amp workshop to members of the Swedish "GMF - Tube Amp Tips" internet newsgroup (Rör Förstärkare Tipsplanket at www.gmf.com). Owe Johnson, a member of the newsgroup, provided essential help - first by twisting Kevin's arm, and then by organizing the workshop nitty gritty. The result was that on Saturday May 17, Kevin O'Connor, his wife Wendy O'Connor, Owe Johnson and 14 participants all showed up in the same place: the Balsta Music Castle in Eskilstuna, Sweden. The workshop was geared towards most levels of experience, from beginner (able to read schematic diagrams) to advanced. 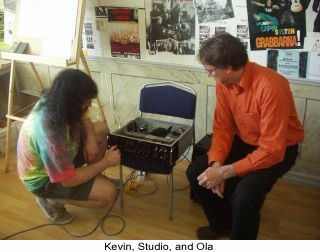 Following a discussion of tube operation, Kevin presented details of preamp and power amp operation in a relaxed and thorough manner. Topics such as transformer action and how chokes really work were explained with drawings and easy to understand language. Participants were encouraged to ask questions and add details from their own experience, and many did. 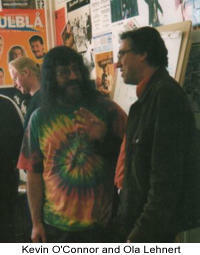 Their enthusiasm gave the discussion a happy momentum. There was never a dull moment - in fact, we almost missed lunch! The questions asked by the group were diverse, and meant that even unconventional circuits such as the MusicMan cascode output stage were explained in a way everyone could understand. Impedance matching, bias, and other topics often misrepresented on the net were dealt with in a way that made the truth clear. Of course, Kevin always encourages people to believe in themselves and their own intuition about what will work. 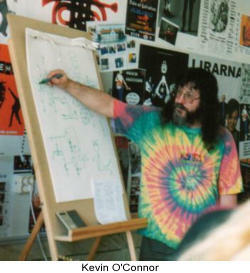 Maybe it should have been "The Zen of Tube Amps" workshop? 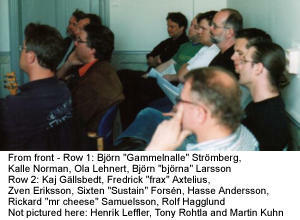 The GMF Rör Förstärkare Tipsplank has been active for years, but most members had never spoken to each other in person. At this event, not only did they enjoy Kevin O'Connor's presentation, but they also finally stepped out of virtual reality and met each other. All would agree that voice transmission via periodically rarefied air waves is more efficient than the best binary code dumping, even given fibre optics ... the limiting factor is that damned keyboard. Also, you get to smile at each other. Kevin O'Connor concluded the discussion with details of how his proprietary Power Scaling technology works inside a tube amp. Power Scaling is available in London Power amplifiers, and also as kits that can be installed by any hobbyist or technician with advanced skill. With the discussion done, it was time to see and hear Power Scaling in action. 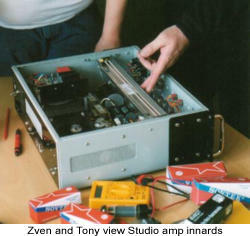 A London Power Studio amp was opened to reveal the Power Scaling installation and over-all construction - no one had seen Teflon circuit cards before. 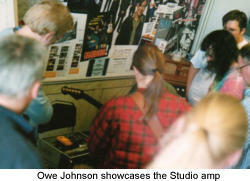 Owe Johnson obliged us with searing guitar licks and mellow tunings (well, mostly searing licks), while Kevin O'Connor manipulated the Studio amp's front-panel controls, explaining what was happening electronically while everyone could plainly hear the sonic effects. 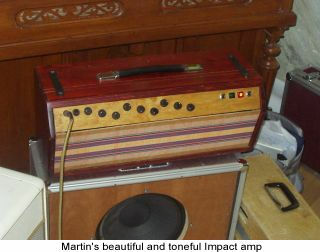 Participants were impressed by Power Scaling's ability to reproduce any tone normally associated with high volume, at any level from whisper to wail. The Studio's Sustain and Body controls also garnered compliments. The Studio is shipped to customers with 6V6, 6L6 and EL34 tubes, and was demonstrated with all three types. First we heard the creamy character of 6V6s. Then a pair of EL34s revealed what they can really do and showed off more of the amplifier's capabilities. The clean tone generated by a pair of EL34s was pleasing to the blues players in the room, who normally think of this as a "rock" tube. Then, one EL34 was replaced by a 6L6 to everyone's amazement! 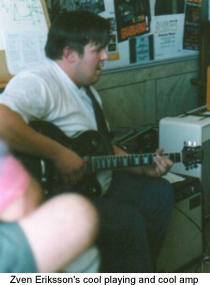 We all liked Owe's playing, too. 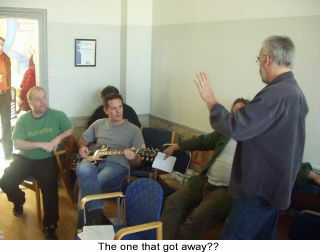 When participants were asked if someone else would like a turn, Ola Lehnert (of City Music in Stockholm) said "Noo-oo!" but inevitably nearly everyone tried out the Studio amp. Workshop participants had been invited to bring along their own tube amp projects to demonstrate to each other, since this can't be done very well over a newsgroup. Many impressive home-built or modded amps were shown off, and great ideas were shared. The raw musical talent in the room was incredible! If you think you play well, visit Sweden for a reality check and a big piece of humble pie. Afterwards, it was off to the pub for dinner and refreshments, where the tech talk continued for hours. The night before the workshop, the Studio amp had been put through its paces by Anders Bergdahl of Fuzz magazine, a Swedish-language guitar monthly. He also interviewed Kevin, finding him friendly and knowledgeable but with the inevitable "Yes, but..." qualification to most questions. As Kevin says, " Tube amps are not black and white. They usually live on the middle ground in any discussion since they never do exactly what you expect. But... that's why we love them." We were pleased to be able to give our workshop at Balsta Music Castle. 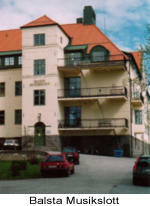 Balsta Music Castle (Balsta Musikslott) has existed as a meeting place for the local music movement in Eskilstuna since 1979, and has around 70 rehearsal rooms. Balsta is viewed as a breeding ground for local music activities but is also a creative arena for temporary as well as long term meetings of a musical character between people. 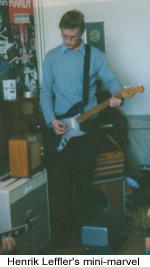 Both amateurs and professional musicians can meet here to develop their creative talents. Balsta is run by several organizations in cooperation. 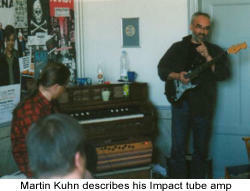 It is a very dynamic and welcoming place for musicians. Kevin and Wendy wish to thank Owe Johnson. Our thanks also to Bosse Lundkvist at Balsta Music Castle, for generously providing the venue for this event, and bunks for 2 nights. Thank you to the "plankers" who attended, and those who wished they could attend (perhaps we'll rope you in next year). 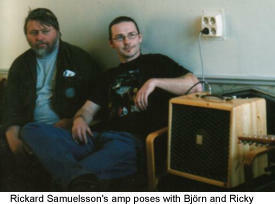 Thank you for sharing your expertise and your enthusiasm for the subject of tube amps, and for being so nice to us! Your kind comments touched our hearts. A special "thanks again" to Tony from Helsingborg for springing our cartons of books from the Customs house in Malmö. It sure is lucky you had your phone turned on in that Burger King line. Amp Healer Owe Johnson www.amphealer.se.